In the gaming world, there's a type of game that requires a certain amount of nurtured skill and a dash of pure unadulterated luck: Racing games. And while the goal of each title is usually the same (you know...make it to the finish line first), players can easily recognize the different styles of racing games developers have been producing for years now. We have the simulation racers, making things as life like as possible. But there's also a market for the more eccentric and imaginative racing games. For me, one of the classic series of fun and creative racing games was a little series by the name of Snowboard Kids. Released in Japan around mid December of 1997, Atlus and Racdym (Now going by the name of Racjin) opened the door to a wonderful world of snowboard impossibility. 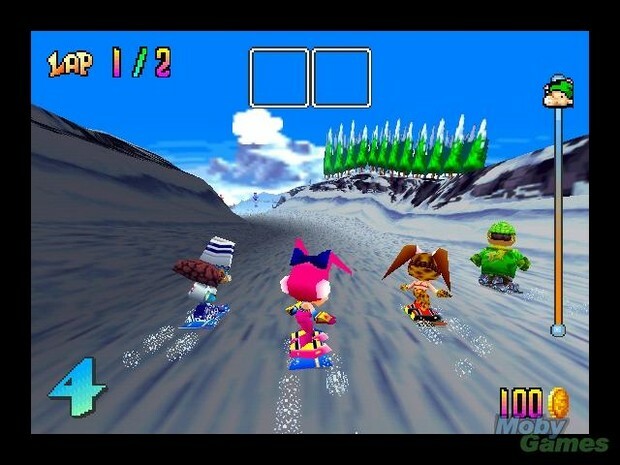 Courses in the first Snowboard Kids included a dry desert and a dark lit highway; places where snowboarding wouldn't physically be possible. And while I'm most familiar with the second installment of the game, I can't help but adore some of the songs that accompanied the first in the series; songs like the epic and entrancing Big Snowman. Set in a winter wonderland, the player has plenty of time to get acquainted with the music on this relatively long, 2-lap race down the mountain. And if you manage to dodge the opponents bombs, rank-sapping parachutes, and falling pans, 1st place will net you a grand 3,600G. Not too shabby. No one is really giving anyone in this game points for their clothing style during this race. 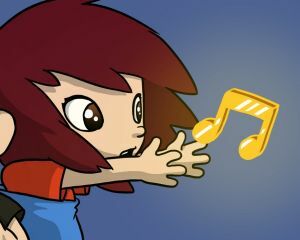 Those of us who are familiar with the Snowboard Kids series can almost immediately identify the music behind these creations; The Racdym Sound Team has managed to create a specific style for their games from their incredibly well thought out and implemented melodies, to the synths that pack a pleasant punch. Big Snowman is a CLASSIC example of how amazing these songs can be and turns a run-of-the-mill snowboarding course, into a magical adventure. The childlike nature of this game is one of the key factors to why this game is so purely fun. There's an air of innocence to the plot that reminds us all of the playful competitions we all participated in as kids around the age of 10 or 11. I however, wasn't nearly as good at snowboarding as the Snowboard Kids cast, and in no way did I have as much access to the kinds of artillery they pack in those boards of theirs (which is a shame). Otherwise, I probably would've won a few more basketball games with the ability to you know, freeze the other team solid. Just a gamer. Aspiring VG music composer. Pretty chill but also passionate about the things that matter to me ^_^ Also, one crazy kookaburra.